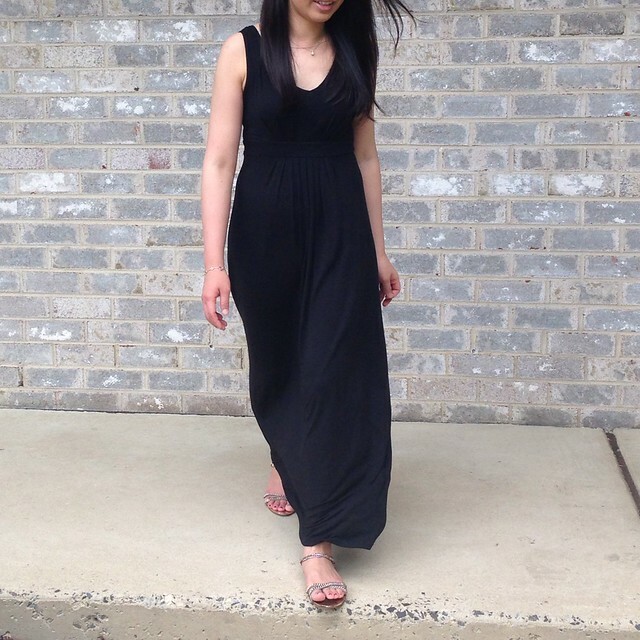 As briefly stated in my previous post, Banana Republic brought back my favorite maxi from two years ago in black. The empire waist is very flattering and the material they used is so soft, stretchy and comfortable. I measured this year’s version after I washed and air dried it and the total length measures 51″. For fit reference, I’m 5′ 2 1/2″. I also recently learned I’m a quarter inch taller since I’ve been saying that I’m 5′ 2 1/4″. Every little bit counts right? Getting back to the topic at hand, the petite length is perfect for me with flats or with wedges because the bottom hem hits right at my ankle as you can see above. 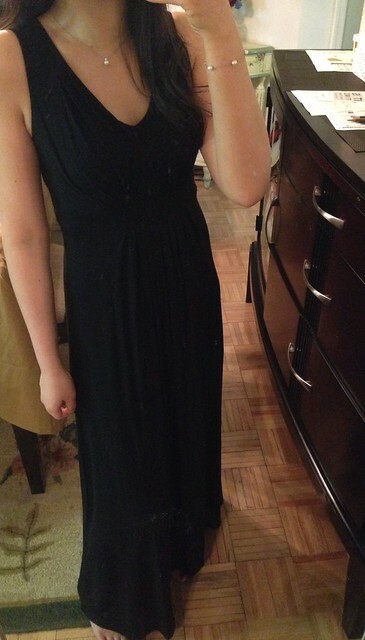 My navy version of the maxi is still too long and drags on the floor even after hemming. It irks me that I didn’t ask my tailor to make it shorter and I’m debating if I should bite the bullet and get it hemmed again. Note that LOFT has a very similar vneck dress (review here) in many colors including white! If only LOFT offered the dress as a maxi as I’m sure their price point would have be much better especially after one of their 50% off promotions. I’m not sure why the white dress isn’t available in petites yet unless it sold out. However, sometimes it just takes a while before the petite version makes it to their website. Here are my picks for this weekend’s Ann Taylor (40% off tops, no code needed) and LOFT (50% off select styles with code FRESH, and 50% off sale styles) sales. I didn’t see anything else that I wanted so I haven’t placed my order yet because I don’t meet the minimum free shipping at either store. If only they combined shipping for both of their stores the way Gap Inc. does for all of their online stores/brands.